George Balanchine | What Makes That Black? The interview questions rolled over and over in my mind as I sped from my home in the Sonoma wine-country toward San Francisco. The trunks of the newly budding Pinot Noir and Chardonnay grapevines punched black against the bright yellow, mustard plants growing between the rows of vines, but I barely noticed. I was nervous, I had already interviewed Ann Williams of Dallas Black, dancer Joselli Deans from Dance Theatre of Harlem, Black historian Joe Nash; and spoken many times to author Tommy DeFrantz. But, I was about to interview my personal hero and mentor Alonzo King of LINES Ballet. Alonzo and Alvin Ailey are my choreographic and artistic, spiritual bodhisattvas. As I drove, my thoughts drifted to Twyla Tharp and her choreographic relationship with George Balanchine as mentor, father, Godlike presence standing in the corner of her choreographic mind. From the grave Balanchine enables for Tharp, by example and philosophy, a deep understanding of artistic potentialities. How blessed we are to have these people who, as Maya Angelou elegantly stated, “Have paid for us” so that we can go the next mile in our own understanding. Alonzo is clearly that for me. I was quickly snatched from ponderings by the circling red and blue lights of the police officer signaling me to pullover. It appeared that I had “blown off” a few speed changes in my King-Ailey-Tharp-Balanchine reverie. As the “all too nice” CHiP-officer pulled away I realized I was much calmer, which, for an interview with Alonzo, is a good thing. Alonzo’s demeanor is very steady, passionate, firm, and knowing – like a great ancestor embodied – so my post-speeding-ticket calmer-radiance was a “better” choice for the meeting. No, this was not “slippage” on my part – simply because Alonzo is black his work automatically contains African-American aesthetic qualities. No, I have seen at least a dozen Africanisms in his last piece alone. I clearly saw Creative Synthesis, blurred lines between the Sacred and Secular, Angularity, Liminal Space, Kujichagulia (self-definition) via the body in motion, Virtuosic Speed, Vitality, High Density, Balanced Asymmetry, Torso Articulations, Syncopation, Polycentric, Suspended Beats, Efficacious Technique, Novelty, Call and Response, Symbology, Nonhierarchical use of vernacular and the canons of fine arts … and that was just in one work – The Moroccan Project. Alonzo continued, “When you go deep enough there is only one force one energy.” My mind went blank. I felt and knew his reference, his truth, because I too believed this. Alonzo is like a Babalawo, a male oracle of the Igbo of Nigeria. He will take you deeper into your own mysticism if he sees you have the capacity, or the desire. During my interview he opened the waters of my ocean and I fell into a chasm. In that singular moment the philosophical pieces of my life flew together – twenty years of study in the field of quantum mechanics and the unified field of interconnected wholeness; twenty-five years of Zen Buddhism and the illusion of separateness and the concept of “emptiness” – that there is no “independent arising”, only dependent occurrences because everything is entangled as one consciousness; five years researching the Central African Bantu philosophy of NTU – the universal unifying force in all aspects of existence. And, finally, my personal experiences as a performer, feeling as though I was “plugged” into the source of the universe, as an instrument of it, a conduit. Spiritually and intellectually I understood… however philosophically I had fallen. For months I didn’t know what to do. The “truths” of my spirituality seem to be getting-in-the-way of the aesthetic “truths I witnessed”. I saw brothers standing on the street with Balanced Asymmetry radiating Cool; where function and aesthetics come together in our clothing and hair; where Celebrating/Flaunting Virtuosity is prized over modesty; where the intellect of the body is equal to the intelligence of the mind or heart; where the possibility of “accidental genius” is built into the system of life – not seen as “abnormality”; where conceptual/philosophical thinking reigns over “boxes” of categories separated by meaningless dates, facts or surface characteristics; where the non-hierarchical use of the vernacular, the colloquial, and the formal allows “Damn man! You are one down erudite discerning mother…!” Throughout my life I had witnessed, participated in, and celebrated with these truths. To add insult to injury, in the February 18th 2008 Newsweek there was an article written by David Gates (It’s a White Thing) professing that, actually, it was white tastes and obsessions that continually distort the music of African-American musicians. I asked myself, “How many of the African-American aesthetic tenets I had gathered in my research were actually tenets of Masking or race etiquette? Was Humor inherent to our worldview, a survival tool, or Masking – just part of the ‘show’?” Between articles like those of David Gates, reading the work of African-American scholar E. Franklin Fraizer, the interview with Alonzo and others I could not reconcile the gaps – a heaviness settled in my heart and I stopped writing. Then came September 2008. Eight days of silent reflection on the sacred feminine in the Mahayana tradition at Spirit Rock Meditation Center. 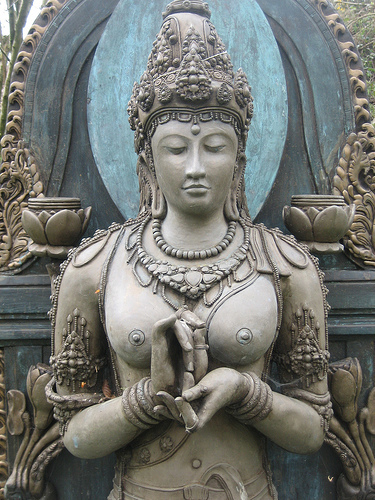 Prajna Paramita – goddess of transcendent wisdom– was the focus for the retreat. As a symbol (symbols are doors/thresholds) she is usually shown with four arms seated in the lotus position on a lion throne. A left hand holds the wisdom Sutra, a right-hand holds the Vajra (symbol of compassion and realization of bliss). Another two hands form the Dharmachakra mudra (wheel turning madras–symbolizing the role of the teacher). This mudra is held in front of the heart and symbolizes many concepts[i]. One of the interpretations being that one hand represents absolute truth while the other represents relative truth. At that moment a bolt of clarity emanated within me–Out of the “one” or absolute truth, raises relative truths – multiple dimensions of the absolute truth. In Complementary Pairs two different banks of the river allow the river. Then I remembered reading several Joseph Campbell lectures and books, such as The Hero with a Thousand Faces, as he quoted a German anthropologist by the name of Adolph Bastian. Bastian spoke of two concepts – the ethnic or folk ideas that are specific to a culture (Volkergedanke) and elementary ideas, which are universal ideas, found everywhere (Elementargedanke). The words of Alonzo King were the emptiness of “absolute truth”; my research was about form, or “relative truth”. I had found my way back. Later, Alonzo wrote a long letter to me addressing, “the one giving rise to the many”. I still read it twice a year, finding deeper meaning upon each reading. His letter, together with my experience during the eight-day silent meditation, enabled me to find a truth. During the interview Alonzo was like the Oracle/Iyanifa character in the Matrix trilogy, telling me exactly what I needed to hear, enabling a profound depth of self understanding and realization. [i] The thumb and index finger of both hands touch the circle represents the wheel of Dharma the three remaining fingers remain extended also rich in significance. The right-hand representing the hearers of the teachings while the left hand represents the three jewels of Buddhism. What Makes That Black? Received 4.5/5 from Portland Book Review! What Makes That Black? Reviewed by City Book Review!